The Kimberley Process, an international watchdog set up to stop the trade of so called “conflict diamonds,” has suspended Central African Republic from the global body after a rebel coalition seized power in the nation last March. Reuters reports the resolution was passed by current Kimberley Process chair, South Africa, and sent to its 80 member states Monday. The ban, which comes weeks after rebels seized control of the country from former President François Bozizé, was announced as fresh news of rebel attacks on villages in the African nation pointed to at least 25 people killed today. The rebel alliance, known as Seleka, overthrew the Central African government in March, raising suspicions that they may have been, and continue to be, funded by the diamond trade. Ever since, Seleka dissidents have been repeatedly accused of killing civilians and looting. The Kimberley Process was established 10 years ago in the wake of U.N. sanctions against Angolan rebels that were financing their war with illegally mined diamonds. The body set up a protocol for diamond buyers and sellers to ensure the traceability of precious stones from mining to processing. The Central African Republic has been among its signatories since the beginning. KP says conflict diamonds today account for less than 1% of the gems worldwide, yet their definition is limited to "rough diamonds used by rebel movements or their allies to finance armed conflicts aimed at undermining legitimate governments." 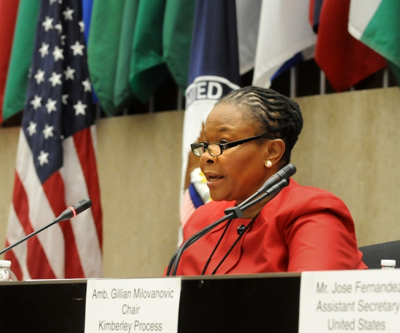 Image: South African Minister of Mineral Resources, Susan Shabangu, at the recent Kimberley Process Intercessional. Courtesy of KP.